Michele Bailey is a successful business woman. She is the president and CEO of Blazing Design (www.blazingdesign.com), a full service design agency in Oakville Ontario, but her real passion these days is helping other women become successful businesswomen as well. Michele gave me a fabulous floral design project for her home for the Christmas season. She entertains a lot throughout the holidays and wanted something fresh, easy to care for and would last until after the holiday festivities were over. Michele also wanted an arrangement that would be a conversation piece for all her visitors, including many of the successful businesswomen in her professional and personal circles. This design was to fill a key spot in her much used kitchen. Michele is one of the most gregarious and vivacious people I have ever known and I felt the design should reflect her unique and charming personality. I knew I had achieved my goal the moment she first saw my creation. 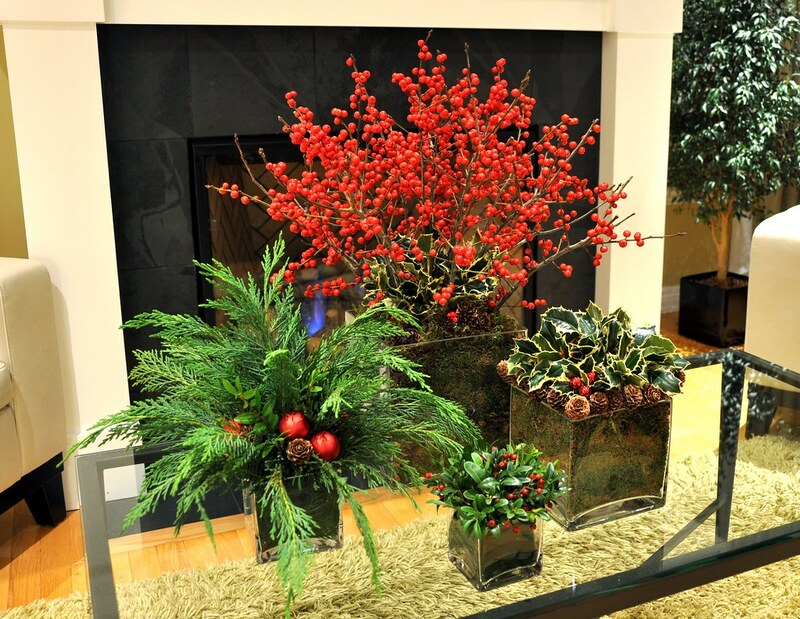 This arrangement is actually a series of square glass vases filled with greens and branches and pinecones. Using different heights and density I’ve built each design in such a way that they all fit into each other to create one vignette. Red spheres – berries or glass balls – further coordinate the elements. If Michele could also choose to separate the vases and each would still be a strong design on its own. This arrangement was created for Adwynna MacKenzie, director of business development for Newtopia (www.newtopia.com). Adwynna is a dear friend and is a wonderful person. Adwynna recently updated the interior of her home to better reflect her personality with a clean, calm, more modern look. She was looking for an arrangement that suited this new look without being too contemporary. 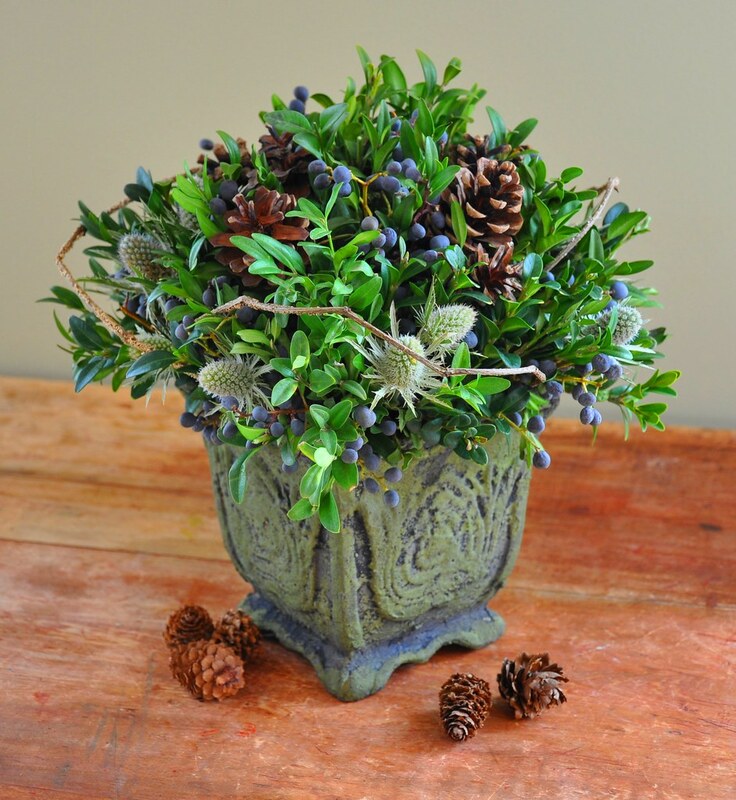 This design is a lovely mix of modern and traditional with the “old world” style container and the unusual use of greens and berries. Boxwood is the only green I used in this arrangement. I simply filled in the spaces with eryngium thistle, ligurstum berries and mini pinecones and completed the look with 3 branches of octopus vine. This large rectangular arrangement looked perfect in Michele Bailey’s great room sitting on a rustic coffee table in front of a grand fireplace. 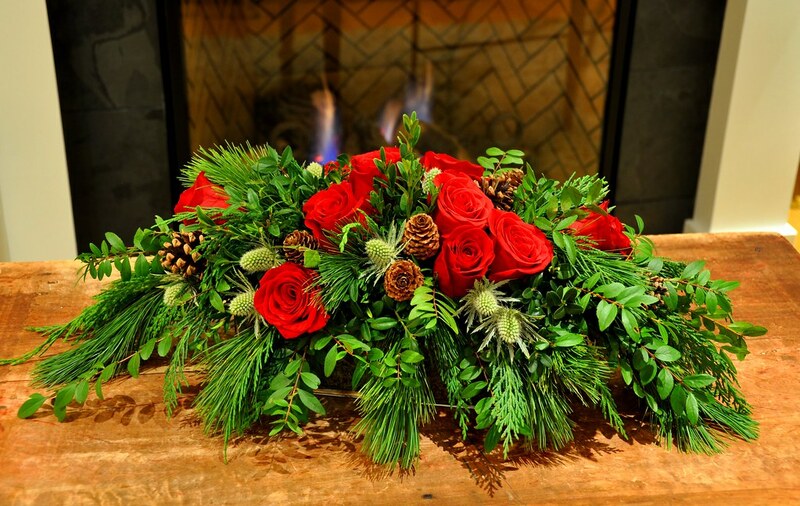 One dozen Christmas red roses were incorporated into a base of greens – boxwood, cedar and pine. I inserted green eryngium thistles and pine cones for textural interest. Green roses used to be quite unique, but are now readily found at the supermarket. 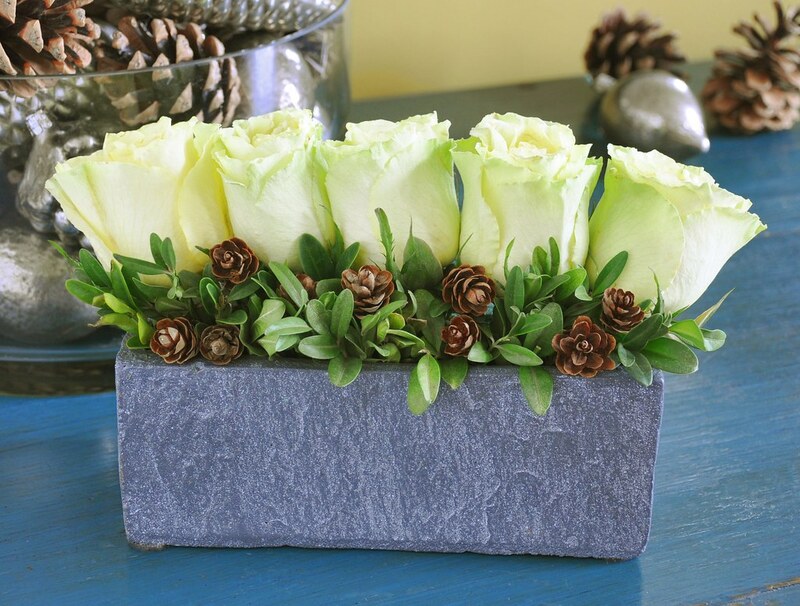 They work fabulously in this very modern holiday arrangement: a row of roses cut short and surrounded by sprigs of boxwood, tiny pinecones and ligurstum berries. The very contemporary, rectangular container – which looks like cement – makes a nice textural contrast. As this year comes to a close I am thinking of all the great ideas I have for blog posts in the New Year, starting with the orchid. Thank you to everyone for your great comments, your support and encouragement and for reading each and every blog post. Stick with it, there are some really great posts to come. This entry was posted in Christmas, December and tagged Christmas, christmas season, Floral Arrangement, floral design, floral designer, floral designs, Roses. Bookmark the permalink. Both comments and trackbacks are currently closed. very cool Aunt Liz. But I’ll gush more on boxing day! Looking forward to seeing everyone on Boxing Day! Hmm…great idea for multiple complimentary arrangements. Will have to try that out. Have greatly enjoyed your first few posts, Liz…appreciate you sharing your creativity. Best wishes for a lovely holiday. Best wishes to you too Cathleen. So glad that you are inspired. I’m looking forward to spring and all the lovely arrangements I can make with spring flowers! All the best to you in 2011! It’s a pleasure to read your blogs and a visual feast too. Merry Christmas and best wishes for 2011. Thank you for your compliments Laurie. Happy Holidays!